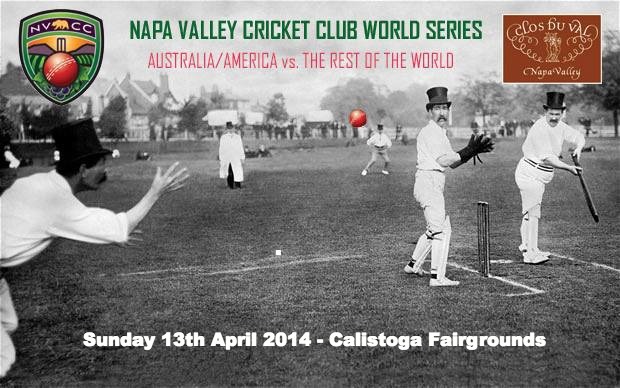 Join us for our 3rd Annual Napa Valley Cricket Club “World Series” as we open our 2014 season in traditional style. See the 2-time winners, Australia / America, take on the Rest of the World in an intra-club game of cricket that starts at 10:30 a.m. on Sunday 13th April. Join us at the Fairgrounds in Calistoga for a day of cricket with wine from club sponsor CLOS du VAL, food from REBEL DOG and beer from NAPA POINT BREWING. Bouncy House and other activities for the kids and an Instant Cellar Drawing!